This is a story of the amazing things that can happen when pure love and unfaltering belief join hands. Several years ago I was fortunate enough to come in contact with an amazing young woman called Alice Pyne. Some of you might have heard of Alice. She was a force of nature and a good works who through the malevolent hands of fate was diagnosed with cancer at the age of eleven. But true to Alice’s nature she did not let cancer rule her life. In the six years she had left she did more good works than most people do in an eighty-year life. She came to the world’s attention through a small Bucket List she posted on Twitter. Within weeks it went viral. She came into my life through a woman I did not know called Vicki Day. I had written a blog about being harassed online and she tweeted to me, that there was this lovely girl in England who was terminally ill who was being bullied as well. She sent me a link to the website. I felt deeply blessed, as I was able to provide one of her Bucket List items. Then over the next few years I got to know the family from afar. Alice’s mom Vicky would be up late and we would chat online. She would tell me that was the life of a mom with a kid with cancer; Not much sleep. The family was amazing. They kept going through it all. Their love, devotion and belief held them all together. It was the stuff of which they were made. And they all made a difference. Alice not only did everything on her list, she did more. She went to 10 Downing Street and met with Prime Minister David Cameron. And she was awarded the Teenager of Courage award at the 2012 Pride of Britain awards. These are huge achievements for anyone, much less a girl yet to reach her 17th birthday. Then when Alice did pass away her mom and sister Milly carried on for her. One of her wishes was to go to Kenya. That was the only one she did not make. But her mom and sister climbed Mt. Kilimanjaro to raise money for her charity and scatter Alice’s ashes. They are the family that keeps on going no matter what. They love, they trust, they believe and they act. I hadn’t heard from them in some time. I keep up a bit on FB. Then two weeks ago I got a Tweet message from Vicky. She had lost a precious necklace on a recent trip to New York. It wasn’t precious as in jewels or gold. 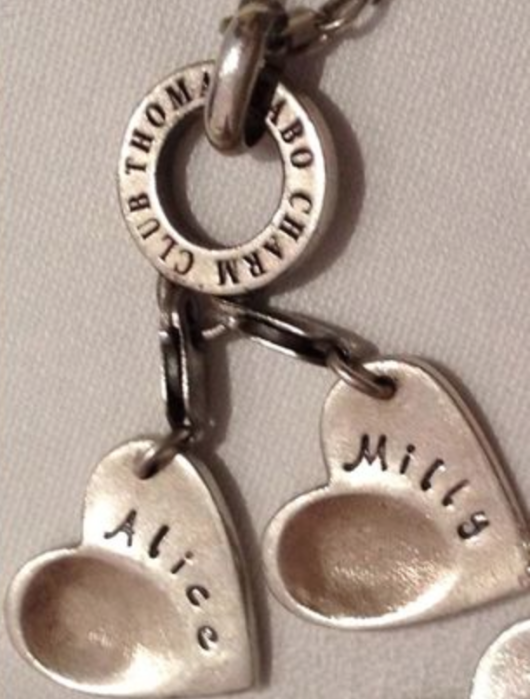 Though it was her most prized possession has it had the imprint of Alice’s finger and one of Milly’s. Alice had had it made for her before she died. Vicky never took it off. Now, I have to be honest, I do believe and I do trust. And I am deeply respectful of Vicky Pyne. But I thought – Oh Vicky, I know this is awful, but it’s Times bloody Square. And it’s been snowing, and it’s over a ten block radius, and it was days ago. I mean…how…just..no…ain’t going to happen. Though I never said that. I told her I didn’t’ have high hopes, but would Retweet. And I did. But Vicky Pyne does not give up. She had NBC do a piece on it. She sent out hundreds, if not thousands of emails and tweets and those all got reposted. And more importantly she believed. She just believed her necklace was out there and she would get it back. And then, I got an email from my friend Michele, they found the necklace. It turns out a man with two little girls, (Vicky has two girls) was in Times Square and one of his daughters stopped to take off her sock or something and he saw a woman looking at something on the ground. So he went and looked at it and it was a necklace. There was Alice’s fingerprint, right there on the ground, almost two weeks later. At that time the gentleman had not heard the story, he merely thought I have two daughters, someone must be missing this. I will take it and hopefully someone will claim it. I assume he then went online and saw the many postings about it. Needless to say – Vicky got it back. What are the chances? They are so infinitesimal. Snow. Crowds. Thieves. Someone kicking it, into the gutter, then the street cleaners sweeping it up; Those are the logical conclusions. But Vicky believed. That was the only fingerprint of Alice’s she had left. She would run her finger over the indentation and feel Alice. It’s where Alice physically still lived, hanging near her heart. In an interview Vicky sums it up perfectly. I also think Alice might have had something to do with it.